The Google Map name for this trail, believe it or not, is “Lost Trail to Coyote Hills Ranch.” The ranch –a horse ranch– in the name still exists but no longer offer horse rides to the public. (Far left below) But there’s actually a more interesting reason to visit the ranch; something called “Therapeutic Riding”. More on that below. There’s five short trails described here, from a 10 minute walk to 2.2 miles out and back. 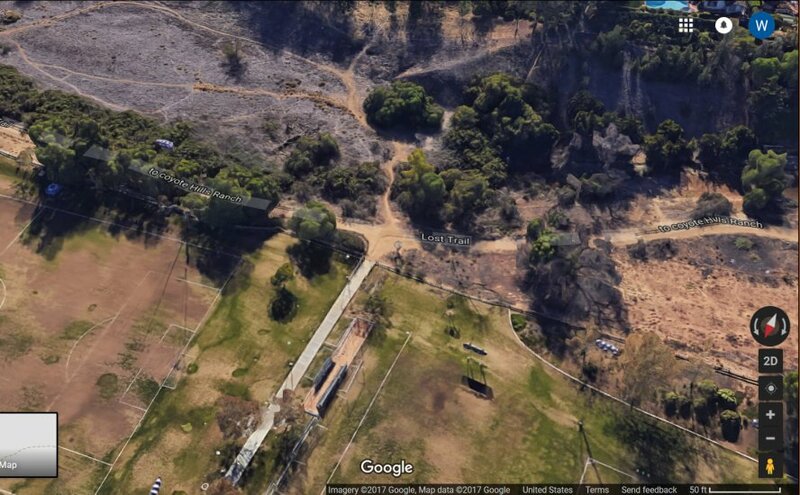 Also discussed here is Trail Rest Park which can be seen on the right in this picture. The out and back trails and the loop described below all start from the Fullerton Sports Complex (upper left in the photo above). It is easily accessible from Bastanchury, east from Harbor, just after Bastanchury makes an S turn. The Sports Complex entry comes up fast on the right. There’s two parking lots. The further in one is closer to the trail. There’s a long sidewalk from the parking lot to the trail. The trail that goes east-west is Lost Trail. The gate should be open by 6:30. 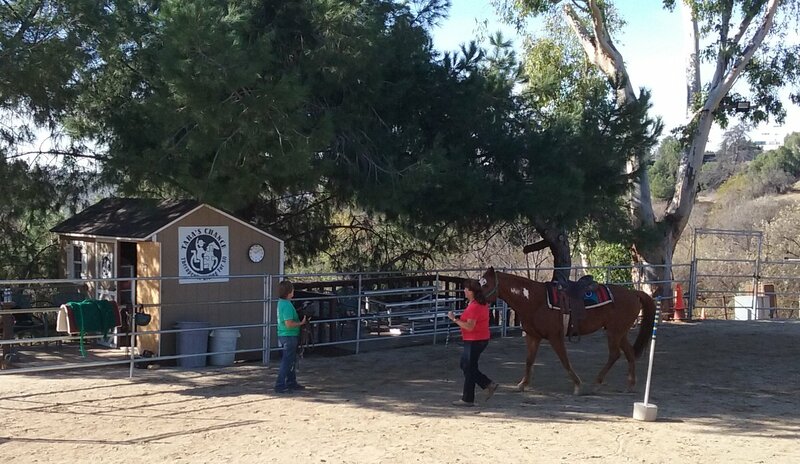 Taras Chance Therapeutic Riding arena at Coyote Hill Ranch. If this horse ranch is your destination, starting at the Sports Complex is way too close. There is a pretty good walk starting from the other side of the dam. For details on where to park click here: Brea Dam (upstream). Another place to start is San Juan Park Trail. That walk takes you through the tunnels under Bastanchury. This is looking south. atop Fullerton Sports Complex. Note side walk to Lost Trail. To the left on Lost Trail is Trail Rest Park; to the right on Lost Trail is Brea Dam Recreational Area and the tunnels to the golf course. 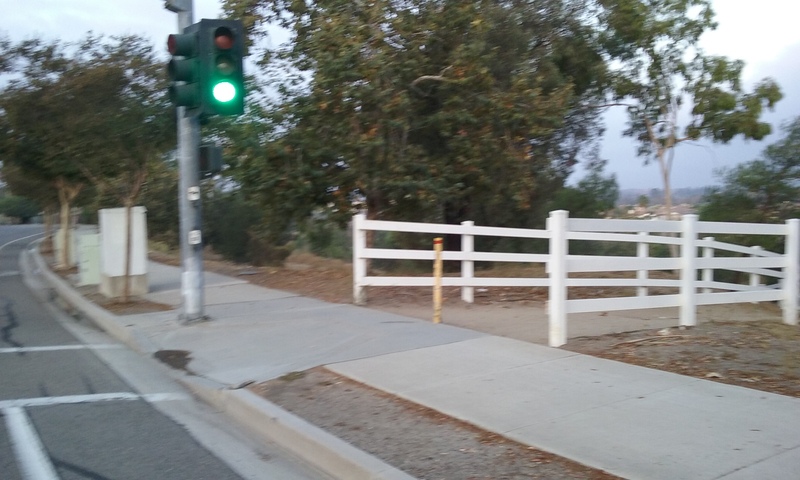 Slightly Longer Out and Back Walks (1 mile) If you start from the Fullerton Sports Complex, instead of going to the right where the Horse Ranch is, if you take it to the left, you will eventually (1/2 mile) arrive at Brea Blvd. The opening on Brea Blvd is mistakenly made to look like a proper entrance. In fact on Goggle Maps it’s labeled as Trail Rest Park. (Perhaps in the future.) There is no park there and it is a little bit misleading to considered it the start of a trail in that there’s no nearby parking. It can be considered an end for a very easy out and back of 1 mile starting from the Sports Complex. More on this “someday” park below. Exploring the Flood Basin The 10 minute walk to the Horse Ranch described above is started by leaving Fullerton Sports Complex to the right. In that direction also, are many branching trails beyond the horse ranch which head in the direction of the dam. The dam is why this 220 acres is uninhabited. It is flood basin. Hidden by dense growth is a creek bed; Brea Creek. Upstream from the dam are two tunnels which go under Bastanchury. Walks within this basin are described in detail here: Brea Dam (upstream). This is looking east at Trail Rest Park on Brea Blvd. Trail Rest Park has great potential as an intersection of three trails. 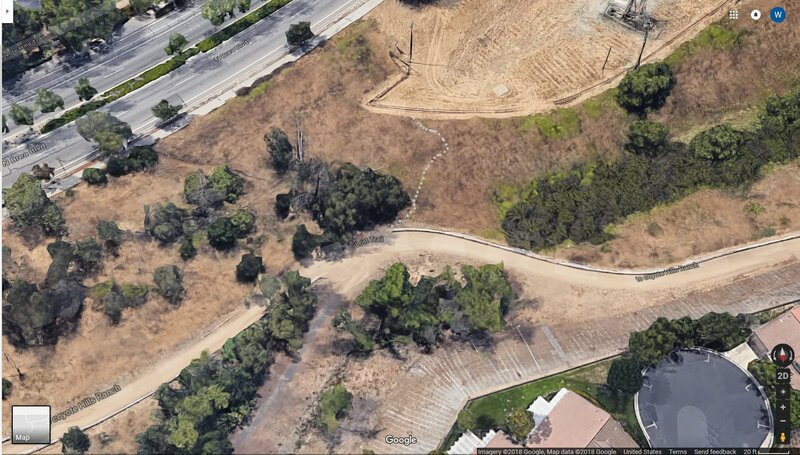 It is clearly seen from a satellite as the dirt color above the trail, but it is almost invisible to see from Brea Blvd. Trail Rest Park The name Trail Rest Park seems to show up prominently on any Google map of this area. But when you get there, it is more of a “virtual” park or hopefully a future park. It is useless as a place to start (no parking anywhere nearby) but it does mark an important junction. (Which is why it may have a future.) There is a signal and cross walk there at Trail Rest Park. It goes into a gated community called Ashford Terrace. 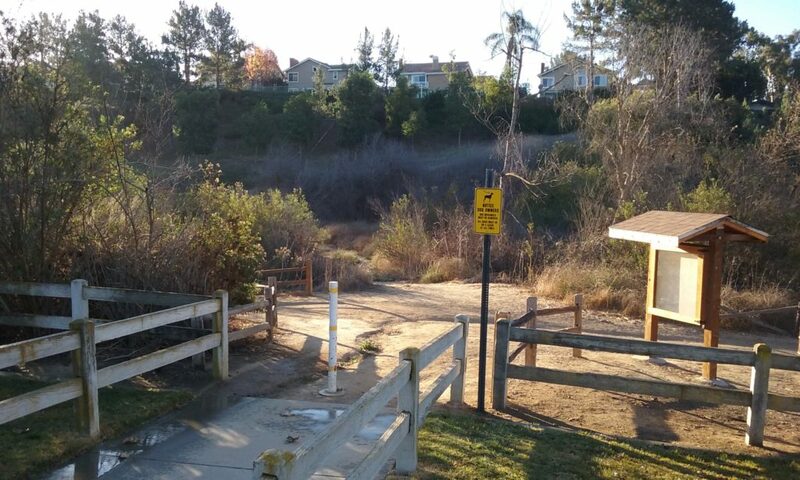 From the east side of the crosswalk you have access to a trail that runs along (the east side of) Brea Blvd. Taking that trail north it is called East Coyote Hills Trail. The trail turns right onto a much wider trail along Bastanchury that goes all the way to State College and the Summit House Restaurant parking lot. 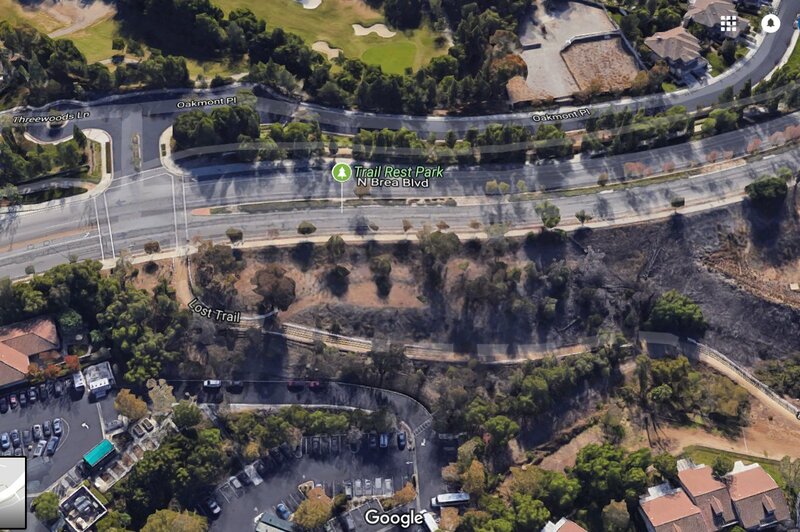 But going south from east side of the crosswalk, the trail along side Brea Blvd is called Panorama Trail. It passes a Little League field, then down into a valley next to a golf course and then up through the very scenic Panorama Preserve, terminating also at Summit House Restaurant parking lot. (Yes those come together to form a four mile loop which is better described in the webpage Panorama Trail. Out and Back to San Juan Park (2.2 miles total) If you take the trail from the Sports Complex to the right and keep to the right you will come to the two tunnels that go under Bastanchury. 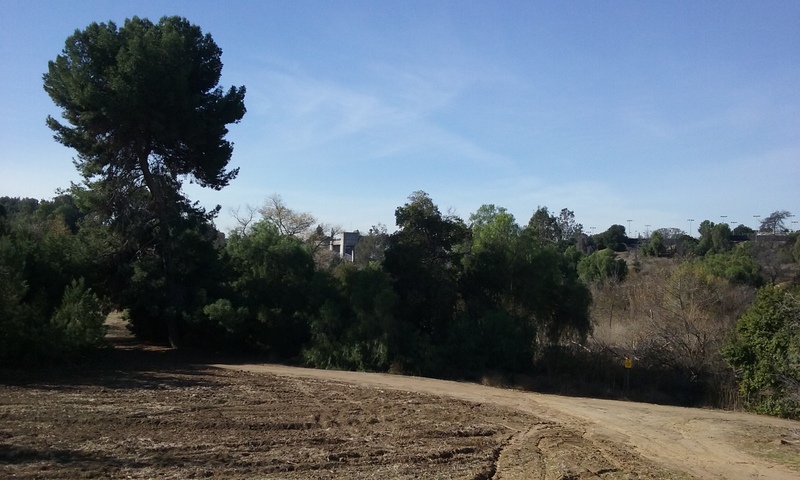 Pass through them and follow the dirt trail (on the left) alongside the fairway of Fullerton Golf Course. 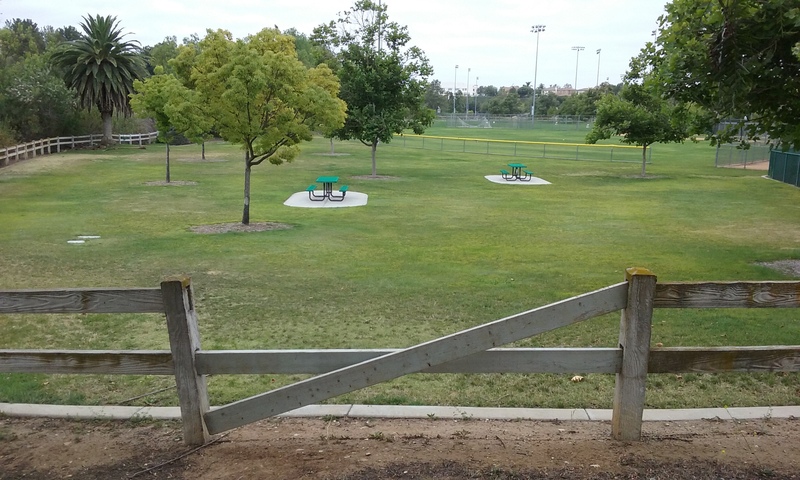 The public trail is supposed to be separated by a fence from the golf course, but you will discover an opening near the drinking fountain that is part of the golf course. The trail is greener on this side of Bastanchury because of the golf course. This is a continuation of the flood basin and this whole area would be quite deep under water in flood conditions. As you walk on you will come to a junior dam which gives you an idea how high the water could be. Feel free to explore the top of this dam. It leads to the offices and lunch counter of the golf course. At the west end of the dam the trail you were on, is interrupted by a road; the access road to the golf course. 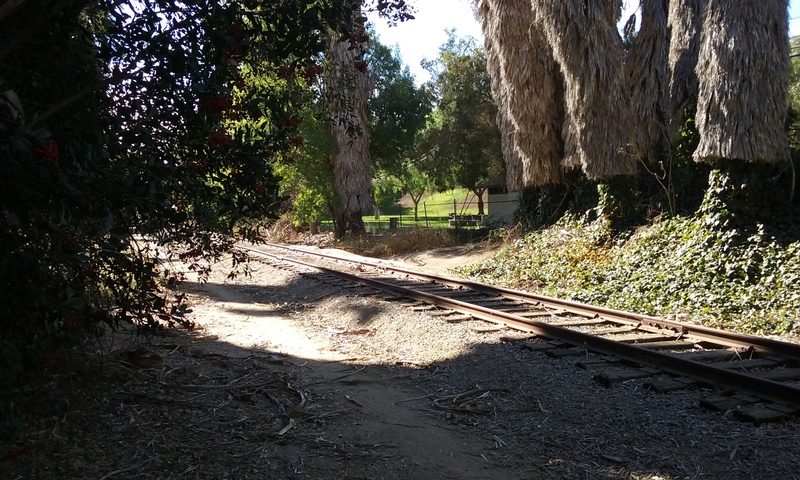 Cross that street and you will see a trail that joins an abandoned rail line. Continue for about .2 mile and on the left you will see one of the greenest parks in Fullerton; San Juan Park. (It was re-seeded in 21016.) To this park and back to the Sports Complex is 2.2 miles. San Juan Park is a very well kept, very green park with picnic table, water and a BBQ. The bathrooms were closed because of a homeless problem. This park is an excellent starting point for several more loops and starting points. When you are comfortable with those you can add them to the journey from the Sports Complex for walks of 4 and 5 miles total. A loop can be made of Lost Trail, by starting at the Sports Complex sidewalk. But don’t go on the main trail. 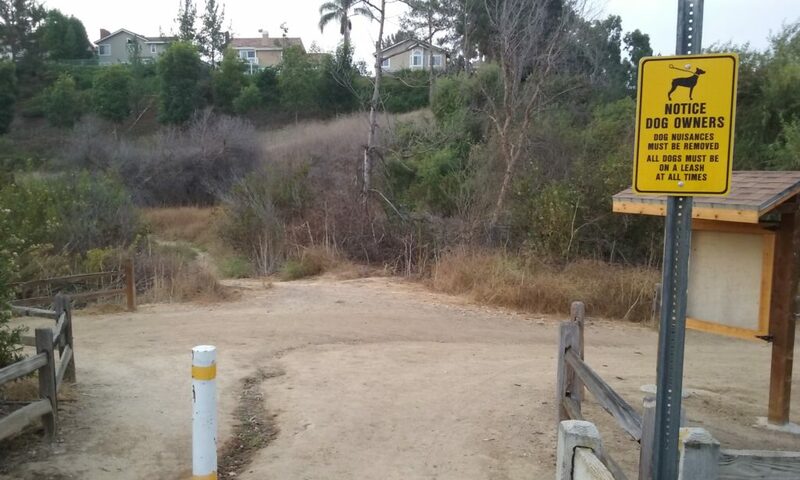 Instead, keep going in the direction of the sidewalk south into a poorly maintained trail. This leads to the left and a very wide flat area where there are many bike sub-trails all of which lead east to a gravel road that is part of the BreitBurn Energy Partners Oil Field. This is an active field and fortunately for us, the fences are around the oil wells instead of the whole area. You may find it interesting to go up close to the oil wells. One of them is wreckage of the well but with pipes come out the well and go south into the hillside. It is actually flow that goes the other way. And it is pressurized water that goes into the ground. It is not just to keep the ground from subsiding but to maintain the water table for existing drinking water wells. ____Here’s an interesting note about not getting lost. Since you are in a basin, you look up to see the horizon where there are landmarks which you may even be familiar with. Even if you are not, they are “places” which are always visible. You would have to be blind to feel lost in this basin even though it is more than 200 acres. This picture was taken from the sidewalk along Brea Blvd. This is looking west into the area you will be walking from. 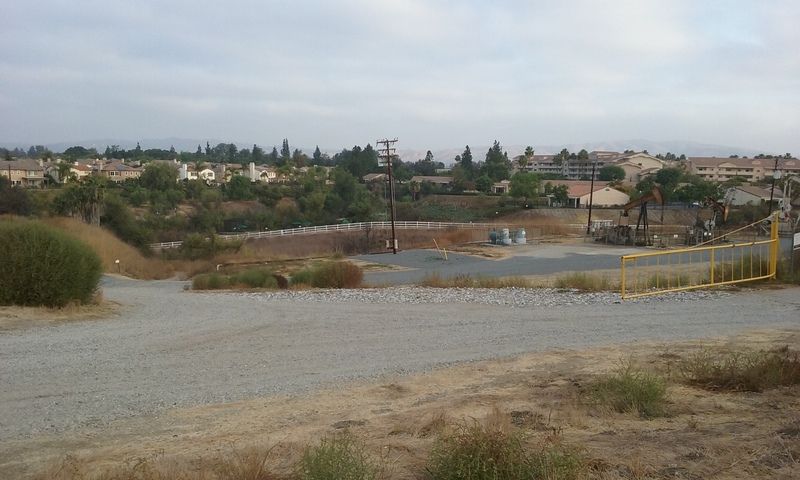 There is a huge vacant lot that is owned by Chevron. Walk up hill on the gravel road and then take the sidewalk north to Trail Rest Park. Where were we? Oh yes amongst the oil wells. Just follow the gravel roads that lead uphill all the way to Brea Blvd. Notice how much unused real estate there is up there. (BreitBurn leases the field from Chevron. And Chevron knows only too well the value of the land there. They even formed a company to manage future sales of land like this. Chevron Land & Development Co.) There’s a huge open gate there. 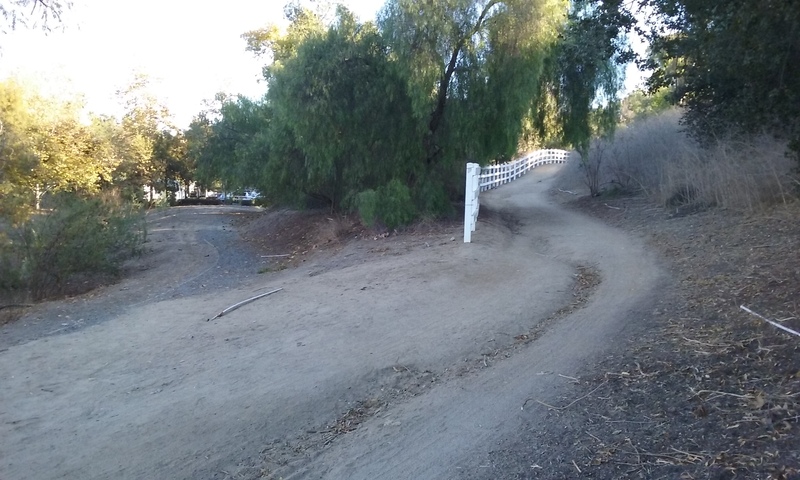 Take Brea Blvd’s sidewalk to Trail Rest Park where you pick up the Lost Trail and then back to the Sports Complex. 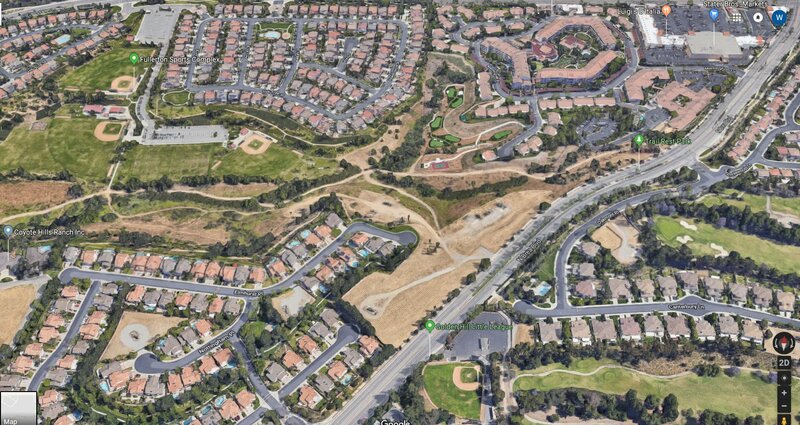 ____Trail Rest Park is so “virtual” it’s invisible even from where the trail meets Brea Blvd. But you can tell where they had in mind to put it because of a very sturdy guard rail which opens up as if there were something there. It is in use –by the way– but not by walkers. It is popular as an off-road bike area. It has hand made hills and turns with embankments. Click on a picture to see it full screen. Grand entry to Lost Trail from Brea Blvd. The tree is in what someday may be Trail Rest Park. This is the Sports Complex sidewalk to Lost Trail. For the 1 mile loop proceed straight ahead and then to the left. This was taken from Lost Trail looking up toward Brea Blvd. To the right is where Trail Rest Park would go… someday. To the left is Park Vista, Assisted Living. They have direct access to this trail. Better view of the start to the 1 mile loop from the Sports Complex sidewalk. The grey dots represents a future path that will allow the loop to be entirely on dirt trails. To the left of the large group of trees is the south end of Trail Rest Park. Trail Rest Park is exactly one acre and has some real potential. There is a trail that leads to the east most picnic area of the Sports Complex. It ends here where there should be a more convenient access. It should be recognized that parks are more than just to play in or walk through. Parks can be considered as something of use by people just driving by. A future use of Trail Rest Park can be just that. A place that looks nice; that looks green and announces that a trail or park is nearby. Because of the unavailability of parking this can never be a place to start a walk, but if it was made to look inviting it would serve as a goal for walks that began elsewhere on the three trails that pass through it or near it. Yes three major trails. A picnic table would be nice in addition to trees. I believe that a source of water for a badly needed drinking fountain is less than a 100 feet away where Park Vista Assisted Living irrigates their side of the trail. It would be nice if there was an information sign at the end of the sidewalk from the Sports Complex which describe walks that can be taken. In the The Lost Trail Loop (1.0 mi) described above, there was a very long portion of the walk on the sidewalk. This isn’t bad of course, but it is a whole third of the journey. It wouldn’t take much work to restore a trail that links the bottom of Trail Rest Park with the large flat area where two oil wells are. (See picture above labeled “The grey dots . . . “. Geo-location: 33°53’45.2″N 117°54’50.4″W ) It would bring even more focus on Trail Rest Park as a junction of trails.